Should Negan's backstory be explored on The Walking Dead, Jeffrey Dean Morgan has an idea of who should help tell that story. During a panel at this weekend's Walker Stalker Altanta, Morgan was asked who he would like to see play Negan's wife (and the namesake of his signature baseball bat), Lucille. As he revealed, he'd like to see his real-life wife, Hilarie Burton, in the role. "If we ever film that, I would go with my wife." Morgan revealed. "I'm gonna say her cause I'll need a place to go after this is over. Hilarie read the comic books and is as much invested in it as we all are. She's said, 'Jeff, could you put in a word for me?'" Lucille's relationship with Negan was front and center in the Here's Negan comic miniseries, which ran in 2016. In the comics, Lucille was diagnosed with cancer, and Negan stayed with her throughout her treatments. She ended up dying from the disease and turning into a walker, causing Negan to ask a boy at the hospital to put her down. According to Morgan, acting alongside Burton in that plotline would make the whole process easier. "I would love to have her on and the scenes they have together, Lucille and Negan, lay the groundwork for who Negan becomes." Morgan added. "It would be a lot easier as an actor to look at my wife not doing well in the hospital and generate those feelings." With The Walking Dead recently debuting its eighth season, it's unknown exactly when Negan's backstory will enter the fold. But with Negan's post-'All Out War' fate possibly revealed in the Season 8 premiere, who knows what could happen next. 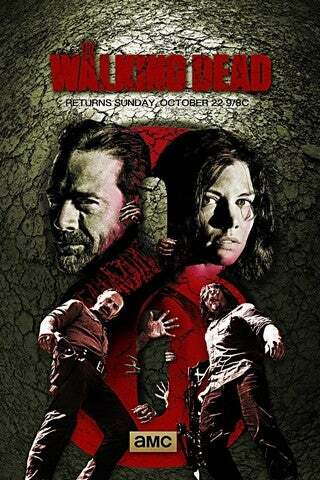 The Walking Dead airs Sundays on AMC at 9 PM EST.